Dates are an inseparable part of Ramadan Nutrition. 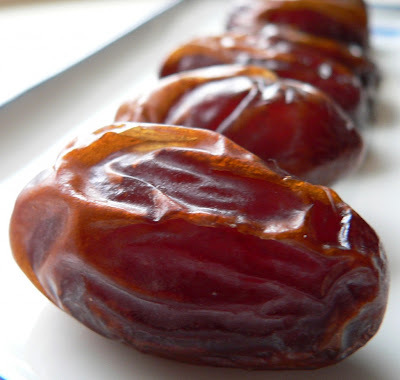 Dates are a powerhouse of energy, they restore the body’s energy, quickly giving you a boost and providing your body with all the essential nutrients to make up for a whole day of fasting. A date contains about 29g of natural occurring sugars that are readily absorbed by your body. But note that since dates are high in sugar they should be consumed in moderation, especially by those who are diabetic or those weight watchers. With that said, this does not mean to totally omit them from your diet even if you are diabetic because dates, consumed in moderation, actually help your body in regulating blood sugar levels, and aid the weight loss process! First, they are rich in natural fiber, which is essential to control body sugar levels, aids your digestive system and speeds up the digestive process and energy metabolism. Fibers allow foods to be moved efficiently through your digestive system, and therefore allow excess or waste to travel through faster and out of your body. Fibers also slow down the secretion of sugar into your bloodstream, therefore stop the blood sugar level fluctuations. The consumption of dates to break fast is therefore essential to kick start the digestive and metabolic process, which you need as you start filling your fasting body with food. Dates are also one of the richest foods in potassium, a mineral that is essential for your nervous system, also for regulating metabolism and most importantly for proper muscle contractions to include your body’s most essential muscle, the heart! They are also rich in a variety of B-complex vitamins, that again help you regulate metabolism and blood sugar, help your body make hemoglobin (produce white and red blood cells) among other things. They also include high amounts of magnesium and iron. Furthermore, these little sweet gems help aging kidneys in the secretion of sodium, which lowers blood pressure, decrease the chance of stroke. And if that was not enough, they happen to also be full of antioxidants that help your body get rid of toxins. They are Cholesterol and fat free too! If that doesn’t spill out Eat Dates, then… I don’t know what does! 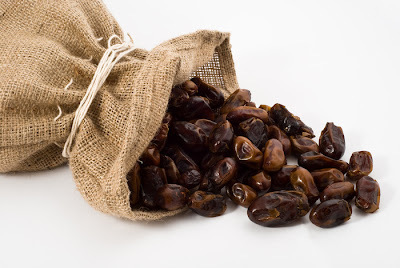 In short, the consumption of dates at iftar to break the fast kick starts your energy, digestion, and gives your body all the nutrients it needs, as well as helps you get rid of the waste! So do that, and break your fast with dates, not just because of traditional habit, rather because your body will appreciate it! Don’t limit your consumption of dates to only Ramadan, instead have 1 a day and keep the doctors at bay! In the Holy month of Ramadan there is also Suhoor to consider. A meal that is to be consumed at Dawn to aid us through fasting. It is recommended you include dates at Suhoor as they will help you maintain your energy levels throughout the day. The recipe below is for gluten-free Banana muffins, which are delicious, topped with the dates caramel in the video above, it will make a beautiful dessert and snack for those who are gluten intolerant. With that said, the combination is so delightful, everyone will love them too. So glad to see this informative post. I have bookmarked the recipe, sugar free is always helpful. Thanks for sharing!